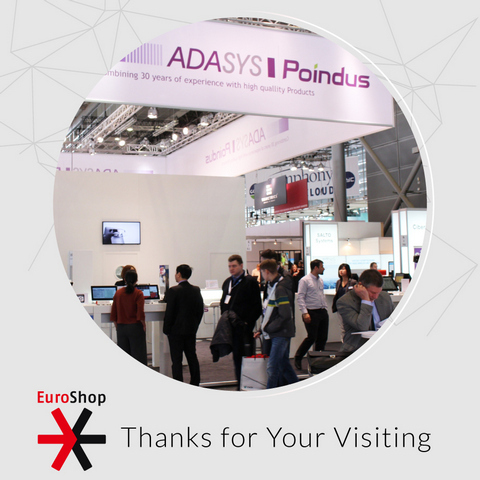 Thanks for visiting Poindus Systems Corp. at EuroShop 2017. It was an enjoyable experience for us and we hope that you can say the same. We just wanted to take a moment and express our appreciation for your interest in our wide range of Products including All-in-One POS systems (VariPOS, VariPOS 210, VariPOS 300/310, ToriPRO, ToriPOS & POSINNO), Panel PC, Tablet (VariPad W & VariPad S2), BOX PC, and Displays. Don’t hesitate to be in touch with any questions, requests for more information or how we can help refresh your look in hospitality or retail for new start in 2017.